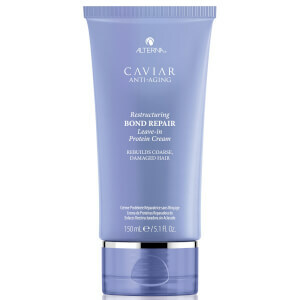 Alterna Caviar Anti-Aging Replenishing Moisture Masque is an intensive reconstructing treatment that revitalizes hair. Protects color and completely rejuvenates hair. Leaves hair glowing with a renewed radiance. Formulated with Enzymetherapy - The Science of Skincare for Hair™ and infused with Seasilk®, Age-Control Complex™ and Color Hold™. Apply to towel dried hair and massage throughout the hair. Use a wide tooth comb and comb product through the ends of the hair for even distribution. Leave on for 3-5 minutes, then rinse well with water. For more intense results, wrap hair using a warm, moist towel for 5-10 minutes before rinsing. Aqua (Water), Cetearyl Alcohol, Cetyl Esters, PPG 3 Benzyl Ether Myristate, Cyclopentasiloxane, Butylene Glycol, Octyldodecyl Ricinoleate, Propylene Glycol Isoceteth-3 Acetate, Behentrimonium Chloride, Cetyl Alcohol, Divinyldimethicone/Dimethicone Copolymer, Cetrimonium Chloride, Polysilicone 15, Foeniculum Vulgare Seed Extract (Fennel), Ganoderma Lucidum Tyrosinase (Mushroom), Glycine Max Symbiosome Lysate (Soybean), Glycine Soja Seed Peroxidase (Soybean), Saccharomyces Copper Ferment, Saccharomyces Lysate Ferment, Saccharomyces Zinc Ferment, Amino Acyl TrNA Synthetase, Calendula Officinalis Flower Extract, Cassia Italica Leaf Extract, Rhodiola Rosea Root Extract, Chamomilla Recutita Flower Extract (Matricaria), Tuber Magnatum Pico, Algae Extract, Boswellia CarterII Extract, Bromelain, Arnica Montana Flower Extract, Angelica Archangelica Root Extract, Coriandrum Sativum Fruit/Leaf Extract (Coriander), Corn Oligosaccharides, Daucus Carota Sativa Root Extract (Carrot), Hydrolyzed Soy Protein, Lactoferrin, Adenosine Triphosphate, Lentinus Edodes Tyrosinase, Malva Sylvestris Flower (Leaf/Stem Extract) (Mallow), Dimethicone PEG 7 Isostearate, PEG 7 Amodimethicone, Hydrolyzed Soy Protein, PG-Propyl Methylsilane-Diol, Sodium Hyaluronate, Sodium Polyaspartate, Niacinamide Polypeptide (Vitamin B3), Oenothera Biennis Flower Extract (Evening Primrose), Pantothenic Acid Polypeptide (Vitamin B5), Acetyl Methionine, Acetyl serine, Ascorbic Acid Polypeptide, Copper Lysl Oxidase, Papain, Melanin, Peptone, Phospholipids, Phytosphingosine, Pikea Robusta Extract, Quillaja Saponaria Bark Extract Retinyl Palmitate, Rosmarinus Officinalis Leaf Extract (Rosemary), Silk Amino Acids, Spiraea Ulmaria Flower Extract, Superoxide Dismutase, Theobroma Cacao Extract (Cocoa), Urtica Dioica Extract (Nettle), Vitis Vinifera Seed Oil (Grape), Wasabia Japonica Root Extract, Stearalkonium Chloride, Panthenol, Polyquaternium 10, Hydrolyzed Silk, PG-Propyl Methylsilane-Diol, Crosspolymer, PEG 45M, Hydroxypropyl Guar, Caprylic/Capric Triglyceride, Glycerin, Propylene Glycol, Pentylene Glycol, Citric Acid, Butyl Methoxydibenzoylmethane, C11-15 Pareth 7, C12-16 Pareth 9, C12-13 Pareth 23, C12-13 Pareth 3, Trideceth 12, Trimethylsiloxyamodimethicone, Methylparaben, Propylparaben, Diazolidinyl Urea, Disodium EDTA, Perfume (Fragrance), Linalool, Red 40 (CI 16035), Yellow 6 (CI 15985), Blue 1 (CI 42090). I have been using Alterna products for some time and find all wonderful, but especially the masque. 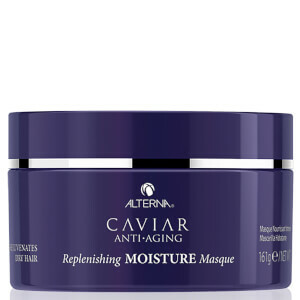 A short while ago I decided to try other alternatives, but quickly came back to my Alterna Anti-Aging Replenishing Moisture Masque. No other conditioner leaves my hair as soft and shiny. After years of tinting, this is the best product I have found for my hair. Other products leave my hair straw-like and unmanageable (I have a unruly hair). With this one, my hair feels as if it had never seen any tint. It also keeps the colour for longer. The 4 stars under 'Ease of Use' have simply got to do with the packaging. I find the tub a little difficult to open with wet hands. Otherwise 10 out of 10! I have now used this product several times with the expectation that it would perform better than Pantene Pro-V. Sadly the results appear to be the same. 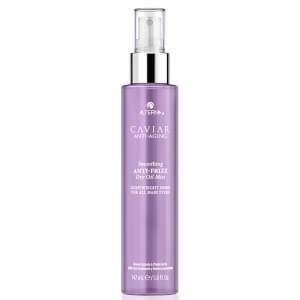 Considering the cost of the Alterna Caviar Anti-Aging Hair Masque I would recommend you first try the far less expensive Pantene Pro-V before investing in Alterna hair products. It is not that I was unhappy with the Pantene just that I am always looking for the best of hair products on the market. I'll try new ones that come on the market when others give high reviews. That being said, the Alterna product is not a bad product just not any better than Pantene Pro-V. This hair masque has made a huge difference. My hair looks radiant and smooth and feels absolutely wonderful. Will definitely buy again. I tried this hair masque because I liked the shampoo and conditioner. I am not sure how I feel about it. My hair is thick,curly, and dry. While rinsing it out I noticed my hair felt strange, kind of rough. It was hard to comb through and pretty tangeled. I expected it to feel silky and smooth after the masque. But, once my hair was dry it was very shiny and felt kind of silky. It made my hair feel different, kind of silky when dry and made the texture feel very different. I don't know if it coats the hair with something or what. Still not sure if I like it or not. It is expensive, but I got it on sale.